The Ultimate Ears brand lineage can be traced back to Eddie Van Halen’s sound engineer in the 1990s, but since 2008, its adoptive home has been Logitech. Known originally for its custom and high-end in-ear monitors, Ultimate Ears now offers a full line of earphones and headphones. The UE 4000 is the only on-ear (supra-aural) model in the company’s lineup, and its list price of $100 also makes it the company’s lowest-priced headphone. Three color combinations are available: black with blue accents, black and white with blue accents, or a bold, bright purple. The $200 UE 6000 is a full-size, closed, over-ear (circumaural) model. Closed headphones attempt to create an acoustic seal that enhances bass reproduction, isolates the listener from external sounds, and limits audio from leaking from the earpieces and bothering those nearby. (For more about different types of headphones, consult our headphone buying guide.) But the UE 6000 comes with a bonus: A small switch on the right earpiece activates noise-cancelation circuitry and an on-board amplifier. The UE 4000 has a clean, modern design, and its plastic construction keeps the weight down while still feeling sturdy. The headband adjusts with almost-hidden sliders whose tolerances are small enough to make hair snagging unlikely. The earpads are covered by soft, imitation leather. The left and right earpieces are indicated by subtle, color-coded L and R markings inside the headband. The UE 4000’s removable cable has a 1/8-inch (3.5mm) plug at each end—straight at the headphone end, L-shaped at the source end—making replacement easy. Inline is an Apple-style, three-button remote/microphone module for controlling playback, calls, and volume level, but the buttons are a small and closely spaced. The microphone output is a little low, and the voice quality is a bit thin and scratchy, but overall the performance is on par with other inline mics I’ve tested. Included with the UE 4000 is a splitter for sharing music with a friend and a soft-lined travel bag, though the UE 4000 doesn’t fold or collapse in any way to make it more portable. The UE 4000’s light weight makes long listening sessions comfortable. The ear pads cushion well, even though the headband exerts enough pressure to help seal out external sound. The padding on the headband is on the thin side, but I didn’t find it to be uncomfortable once I positioned it properly. The Ultimate Ears DNA’s is clear in the UE 4000’s sound signature, with audible similarities to the company’s venerable TripleFi 10 in-ear monitors. There’s a definite emphasis at the lower frequencies, and a rolling off of the high end. If anything, the high end is even more subdued with the UE 4000, making this yet another of the growing number of headphones delivering an over-boosted low end. Out of the box, the UE 4000’s bass response is seriously fortified, but not merely by an increase of the mid-bass frequencies—the bass extension is real, as all but the very lowest bass notes come through clearly and without distortion. Peeking through the bass, however, is a very smooth mid-range and very smooth, detailed high end. It’s just too bad the bass so strongly overwhelms the rest of the audio spectrum. The attractive, modern design of the UE 6000 complements the high-tech noise-cancelation circuitry inside. The sturdy, metal headband has a soft, matte-plastic cover on top and adequate, if not lush, padding underneath. The earpieces attach to the ends of the headband with little range of movement, and are made of hard, shiny plastic in either black or white that looks better than it sounds. A pair of cleverly designed hinges in the headband allow you to fold the headphones for storage and travel. The left and right earpieces are marked with white (L) and red (R) letters inside the headband. The bright-blue interior of those earpieces matches the detachable cable, which is identical to the cable that comes with the UE 4000, including the Apple-style, three-button remote/mic module. Like its sibling, the UE 6000 also includes the cable splitter. Overall, the headphone and its accessories exude a feeling of quality—nothing feels cheap here. Like other noise-canceling headphones, the UE 6000 “listens” for external noise and then adds to your music a signal that’s the inverse of that external noise, canceling it out to some degree. The noise-cancelation circuitry, powered by two AAA batteries housed in the left earpiece, is activated by a small switch on top of the right earpiece. This extra circuitry and the batteries add weight to the headphone, but the UE 6000 remains balanced and isn’t so heavy as to make longer listening sessions uncomfortable. Quite the contrary, the UE 6000 is a very comfortable headphone: The ear pads are first-rate: soft, amply padded, with high-quality coverings. Smaller ears will fit inside, while those with larger ears will need to jiggle a bit to get a perfect fit. The noise-cancelation feature makes it less necessary for the headphones to squeeze your head tightly for isolation, so the fit is relatively relaxed for this kind of headphone. My only other extended experience with noise-canceling headphones was with Bose’s Quiet Comfort 3, which I used to listen to during international business trips. I was impressed by that model’s noise-canceling and audio performance in that context. 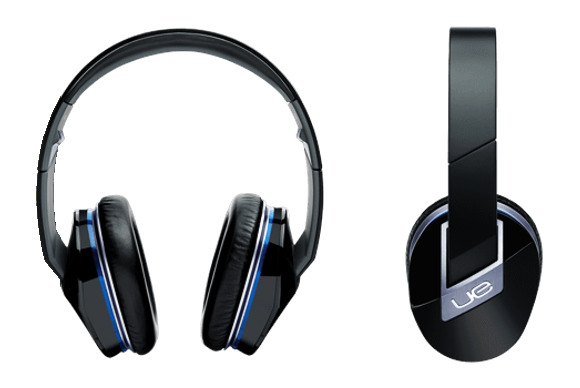 The noise-cancelation feature of the UE 6000 is much more subtle and much less aggressive. In fact, if noise cancelation is a priority for you, you may be disappointed. I found that the UE 6000 did a good job of eliminating the hum from a small space heater under my desk, but it had zero affect on the noise from a hair drier in the next room. Of course, noise-cancelation technology is inherently limited in its effectiveness, but compared to Bose’s popular (and much more expensive) model, the UE 6000 simply doesn’t “cancel” as much noise. On that note, as with other noise-canceling headphones, the audio performance of the UE 6000 depends on whether the noise-canceling circuitry is on or off—the sound character and quality differs greatly between the two modes. Since noise cancelation is a distinctive feature of the UE 6000, I focused my testing on performance with noise cancelation active. It didn’t surprise me that the big brother to the UE 4000 can deliver good sound quality. Unfortunately, like it’s smaller, less-expensive sibling, a bass emphasis steps in and deprives the UE 6000 of its crack at stardom. The highs are clear, smooth, and detailed, and the midrange frequencies are natural and nicely nuanced, but as with the UE 4000, all this goodness is almost buried beneath the emphasized bass. The bass response, while full, rich, and powerful, bleeds seriously into the lower midrange, and one needs to strain to hear how good the underlying midrange and treble frequencies are. The soundstage is also good, perhaps a bit better than average in this price range. In other words, hiding under the UE 6000’s over-emphasized bass is a very capable headphone. I heard little hiss with noise canceling enabled, a common issue with noise-cancelation headphones. In fact, the feature produced no other audible artifacts. The UE 4000 is a stylish, comfortable headphone capable of producing quality sound for under $100. It competes very well with other on-ear headphones in its price range. Those who like a rich sound with emphasized lower frequencies will love the UE 4000 right out of the box, while those preferring a more-neutral sound will need to resort to equalization to find satisfaction. The UE 6000 is more difficult to sum up. The noise-cancelation feature isn’t very effective at actually canceling noise, but it’s very good at enhancing the UE 6000’s dynamic range. How much consideration should be given to performance with the noise cancelation switched off? How much equalization should the headphone be allowed? Should the consumer have to make these kinds of adjustments, or do we look at what the headphone is capable in a “best case” scenario? There’s certainly very good sound to be had here, and it’s a comfortable headphone that seems very well made. If you like your bass big or don’t mind fiddling with equalization, the UE 6000 is a solid headphone choice. If mild noise cancelation is also a plus, the UE 6000 deserves your consideration. The UE 4000 is a stylish, comfortable headphone. Its sound quality is good for the price, if a bit bass-heavy. The UE 6000's noise-canceling feature doesn't excel at canceling noise, but it oddly enhances the headphone's overall sound.